Hosted by: Rick at The Book-A-Week Project, Laura at Reading In Bed, and Poppy at Poppy Peacock Pens. 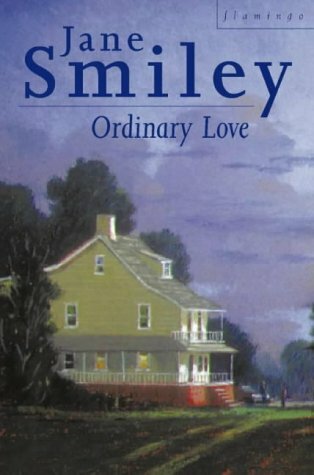 Quite a while ago, I don’t remember when, I had heard that Jane Smiley’s novellas were very good. Despite owning a couple of her books, I still haven’t read anything by her, so I thought this might be a good opportunity to give her a try. I enjoyed both of these, but Good Will probably came out ahead. Ordinary Love is about a dysfunctional family. The parents are no longer together and the kids are grown. When the youngest were 5 years old (twin boys), their father took them away and they didn’t see their mother again for years. After that, they saw both parents on and off, depending on who the father wanted around and who he wanted to send to their mother. Even though this must have been awful for the mother, she doesn’t dwell on what can’t be changed. Instead, there is a lot of looking back at what happened in the past to help explain the actions of her children (and herself) now, and how the family relates and interacts with one another. And, as the story goes on, we learn more snippets about the past. It was definitely an interesting study of family dynamics. For example, one of the daughters seems to keep close tabs on her mother, possibly as a result of the mother being out of the picture for a few years. And the twins are very different from each other. We soon learn that they were treated quite differently by their father as they were growing up. This story makes us think about how what we say and do to a child, even when we don’t realize it, can easily determine the kind of person they become. But the story is ultimately about the love of a mother, and how, even after a rough ride, it can still be shown and felt and acknowledged. I try to accept the mystery of my children, of the inexplicable ways they diverge from parental expectations, of how, however much you know or remember them, they don’t quite add up. The bodies in the house, whose presence comforts me, are the bodies of my children, not my mother and father. What comforts me is not my own safety anymore, but theirs. Away from Pat, I was without anger, without that grating supervision, the constant call for my attention and response. I was no longer a pivot between the boss and the peons, responsible to everyone, the miraculous fragmenting woman, pulled apart everyday only to be knitted together every night so that she could be pulled apart again in the morning. Bob, a Vietnam veteran, his wife Liz, and their 8-year-old son are living off the grid. Despite (or, maybe because of) the fact that their lives are unconventional in most ways (no electricity, no car, no TV, etc. ), they decide against homeschooling their son and send him to school. They are happy and content; their child seems happy; their world feels right. Until one day there is some trouble at school. Their son has deliberately destroyed some dolls that belonged to a classmate. And, what is more, this classmate is the only ‘black’ child in his class. They are shocked and mortified, and when they ask him about it, even more horrified by his response. What could be going on? This story has us thinking, once again, about the ways our children see the world and how this can impact them. It touches on envy and the possible consequences of being different, or, more accurately, feeling different. This story also makes me feel better, as a parent, for giving into some of these modern technological contraptions the world shoves upon us these days that I can never feel quite comfortable with, but that the kids could happily spend their lives on. The way in which the story ends, though, doesn’t sit well with me (and, I’m guessing that it’s not supposed to). Is it inevitable that we give in to societal pressure to be the same as everyone else? Why does it have to be so hard to be different/live differently? Bringing children up with values and skills around living simply and knowing how to support yourself should be a good thing, shouldn’t it? Terrifying is when the parents are the source of the trouble, not the kids. I would recommend either of these novellas to anyone interested in reading about families, parenting, family dynamics, the effects of the past on the present, and the effects of society on our lives and the choices we make. Based on these novellas, I can see myself reading more Jane Smiley in the future – what are some of your favourite Jane Smiley books/stories? Both these novellas sound really interesting. I have only read one book by her – A Thousand Acres, and it was very good, but also very depressing. That’s one of the ones I own, so it’s good to know it’s depressing – so I’ll be prepared! I never read any Smiley novellas, but I did read Moo in college. I remember that the setting reminded me if Michigan State University, which is a bit of a party school now, but used to be called the “farmer school” because most people majored in agriculture. I remember in Moo that there was an animal barn, but the one line that sticks out the most to me is a student studying who hears his roommate arguing. The roommate is telling his girlfriend that he can tell she’s gained 2-3 pounds, and he’s demanding she lose it. Ew. If I remember it so clearly, though, it must be well written! I think I own ‘Moo’. It’s a good sign that it left an impression! Jane Smiley is not the media star that Jonathan Franzen and others are. The thing I admire about Jane Smiley is that she takes her job as a writer, and storyteller, seriously. Her biggest concern is the story she has to tell. Like Andrea Barrett, she goes after stories that many other writers ignore. She may not be a great writer, but she is in a league that few other American writers inhabit. If you think this is high praise, it is for a thoroughly wonderful writer. I would definite recommend two of her best, The Greenlanders and A Thousand Acres. What I liked best about her stories was her insight into human nature. Her characters and their lives felt very real. I own A Thousand Acres, so it’s good to know you recommend that one. And, I’ll have to check out The Greenlanders, too. I haven’t read much of Smiley’s back catalogue apart from Moo and A Thousand Acres, but I really liked Some Luck so have been meaning to seek out the final two books in that trilogy (The Last Hundred Years). Also, I enjoy her non-fiction: 13 Ways of Looking at the Novel and a short biography of Dickens. You make her novellas sound appealing! I feel like I know more about her older books than her newer ones. I’ve seen Some Luck around, but didn’t realize it was part of a trilogy! I also didn’t know about her nonfiction. 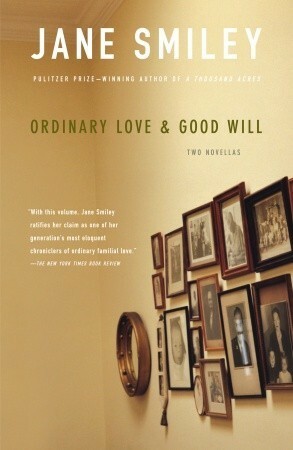 I’d forgotten all about Ordinary Love and hadn’t heard of Good Will. I’d echo Rebecca on The Last Hundred Years trilogy which I recently finished reading – completely engrossing – although I’m afraid I didn’t get on with Moo or The Greenlanders at all. I’ll have to go check out your reviews of her trilogy! I didn’t even realize she had written one, although I have been seeing ‘Some Luck’ around on the blogs. Apparently every Smiley is different, which means each one is a nice surprise to look forward to! I’ve read A Thousand Acres and it knocked my socks off; I’d love to read The Greenlanders, as well as Moo and Lidie Newton. 13 Ways of Looking At the Novel is also terrific, as Rebecca says above! I’ve enjoyed other writing by Smiley. Thanks for pointing this out. One thing I’m finding with the novellas is that they are a quick way to introduce myself to authors I’ve never read before. 13 Ways sounds interesting. It sounds like a lot of people have liked it! Private Life is one I’ve not heard of. Ooh, I’ve read some of Smiley’s novels but no novellas I have a few in the 746 so must check which ones! These sound great. Yay, some to look forward to! Reading her novellas were a good way to try her out – I’m glad I read them! I don’t think I’ve ever heard of Jane Smiley. I’m trying to remember… No matter, both of the novellas sound good; the first more so than the second. I will have to check if my library has any of her books. It’s funny – I think I found Good Will a more compelling read, but when I think back on them, I think I like them both equally, for different reasons. A Thousand Acres might be her most well-known book – it won the Pulitzer Prize in 1992. I haven’t read any of Smiley’s novellas. In fact, I wasn’t aware that she had written any. I’ve read several of her novels. The best one was A Thousand Acres, which is a rewriting of King Lear. I really found that one impressive. Yes, but from the point of view of the daughters. I’ve enjoyed everything of hers that I’ve read, although some (e.g. Horse Heaven) take some time and concentration because there are a lot of voices to settle into. Some move a little more slowly than others (e.g. Lidie Newton) but they are great for sense of place and character, whereas others (e.g. Moo) seem to move at a faster pace (or maybe that’s just me). I’ve lost track of her most recent ones, but keep collecting, because I like the way she tells stories and I’ve never yet been disappointed. I’d love to reread Thousand Acres, especially as I loved Alexi Zentner’s Lobster Kings (also a retelling of Lear); even though it is obviously not a happy story, I don’t remember Acres being relentlessly grim either. I”m looking forward to hearing whcih ones you decide to read! Zentner’s book is a contender for letter ‘Z’ in my project. Maybe it would be cool to read them close together.